“The 2019 Toyota RAV4 Gets Tough” was our headline when we first saw the new-generation Toyota RAV4 last year. 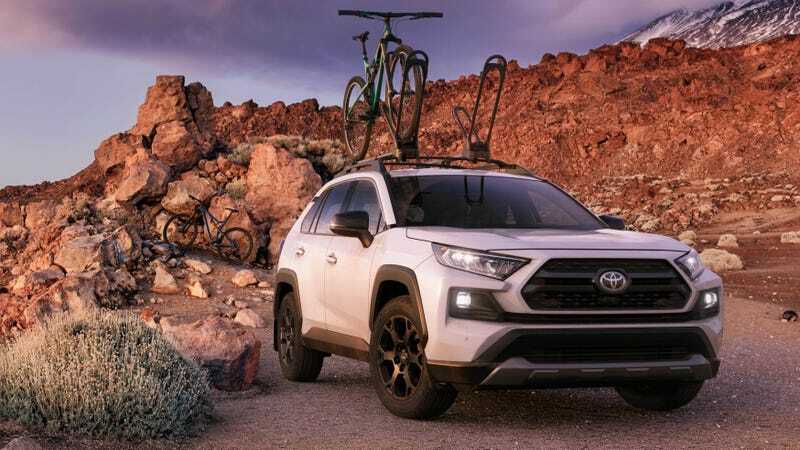 And yesterday at the Chicago Auto Show, it became clear that Toyota is all-in on this push for aesthetic “ruggedness” when the company unveiled a 2020 Toyota RAV4 TRD Off-Road. Yes, seriously. Off-road vehicles are hot right now, especially in the U.S., where people can’t stop drooling over Ford Raptors, Jeep Wrangler Rubicons, Chevy Colorado ZR2s, and also Subarus. So, to get in on the fun, Toyota launched a new generation RAV4 with chiseled looks, and an Adventure trim level, which forms the basis for the new TRD Off-Road variant that Toyota just unveiled at the Chicago Auto Show. Here’s the fun-ish part: the RAV4 Adventure variant, which comes with a more aggressive grille and fog lamps, standard all-wheel drive with torque vectoring and terrain select mode, overfenders and roof-rails. That actually looks like it could be a good time, under the right circumstances. ...TRD Off-Road suspension is engineered to enhance body control and small-bump isolation to help smooth out trails and rough city streets. Unique red coil springs are tuned for an off-road focus. The twin-tube shocks are re-valved and feature new internal rebound springs to improve rebound control. New bump stops maximize compression direction wheel travel and help improve body control over large bumps and dips. The new, toughest variant of the hot-selling RAV4 gets the same 203 horsepower 2.5-liter inline-four that’s standard across the non-hybrid RAV4 range, as well as an eight-speed automatic. So nothing’s changed in that department. Still, Toyota also mentions some aesthetic differentiators between the TRD Off-Road and the Adventure trim besides just the wheels. For example, there are standard LED fog lights, an available exclusive two-tone paint combination, and dark gray front and rear lower fascias. On the inside, there’s red trim and red stitching, TRD floor mats and rear cargo mat, as well as fake leather front seats with “TRD” stitched into their headrests. It seems that the RAV4 just keeps looking tougher and tougher; if Toyota keeps this up, the thing may someday end up appearing as capable as the first-gen.